Chelsea Manor opened its doors in 1968. Located adjacent to beautiful Trout Lake Park, its residents have access to a wide range of outdoor recreation activities at the area’s Community Centre. 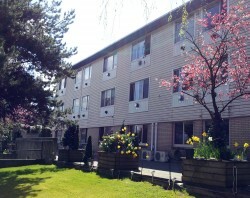 The building is also conveniently located adjacent to the Chelsea Park complex. Large lounge area with kitchen facilities, TV, piano, fireplace and stereo system. Tenants can apply for Shelter Aid for Elderly Renters (SAFER).